When my Brother and Sister-in-Law were planning their wedding, the theme, much like their living room inspiration was to be rustic and comfortable, outdoorsy and have elements of nature and wood. It was then that I came across imagery of candles on wood as centerpieces, and fell in love with the look. I had seen similar looks on Etsy, like this one, and this one. House and Home did a wood candle holder look that I loved – using grey stain, which stuck out to me as far surperior than the darker stains others had been using. So, combining all of that inspiration, I vowed to one day make my own. Aubrey made a wood shed at the cottage during our vacation and one day I walked by the scrap wood and realized the 4’x4’s that were left over, would be PERFECT for this project. Aubrey’s tools were already out, so he just chopped some down to different heights for me. I wanted to use these primarily for votive candles (even though you see taper candles in the very first photo) so Aubrey took his drill and added a drill bit to it, wide enough to hold a tea light. Next, I debated leaving the pillars as is in their “natual” look (leaving them “as is”). But with House & Home’s look in my mind, I decided to go with some stain I already had at home, some of Varathane’s Sun Bleached stain. I liked the look of two coats of stain – no more. The more coats I did, the darker the grey got and covered too much of the wood grain, which is part of the beauty of the whole project. The result I think is stunning, and also a little reminiscent of concrete – which I’m obsessed with. I know we’re still in Summer, but the above look I think would be ridiculously gorgeous on a holiday table setting. But the look I think is really cool, is using this project to hold taper candles, like these gold ones. In retrospect you could drill a smaller hole, which would allow the tapers to fit in beautifully. 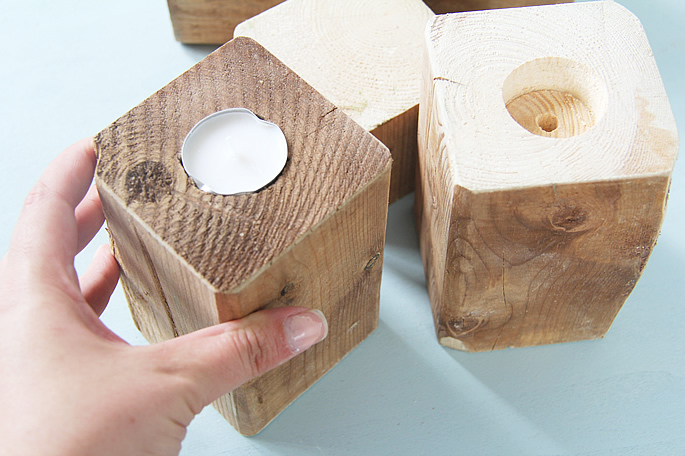 If you couldn’t decide what style of candles you wanted to go with, you could flip the wood over, so you had a multi-use candle holder (one side for tapers, one side for votives). For this project though, I used putty which held the tapers in place but had to only use the holders that were deep enough to really keep the tapers in place. Tapers …………. The Penny Paper Co.
Disclaimer: Obviously when it comes to mixing fire and wood, please use caution and be sure you are always around them when lit.